For those who travel in culinary pursuits, Turkish Cuisine without doubt is one of the most remarkable grand cuisines of the world. 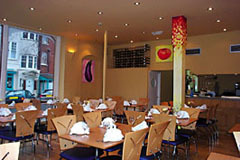 Now you can enjoy the wonders of Turkish cuisine in this friendly family run restaurant. We offer a traditional style of cooking, encompassing the best of the Mediterranean with a touch of authentic Turkish dishes dating back to the Ottoman era. Escale offers fine dining in a stylish environment with a heated terrace. Open all day offering lunch, dinner and snacks. Open every day noon-11pm. All major credit cards accepted (not Amex). 12.5% service charge. The best of Mediterranean dishes together with authentic Turkish dishes. Turkish food is regarded as one of the world's great cuisines. Fresh vegetables have the highest value in the Turkish kitchen. They can also be roasted, fried or served with yogurt. Vegetable courses can be eaten warm by themselves or filled with mince meat and rice (Dolma). They can also be prepared with olive oil as a cold dish. In addition also lamb is offered -, calf and beef and much chicken. Pork meat is forbidden to the believing Moslem, and fish has become very expensive over the last years. The range is enormous, from the many soups to an astonishing variety of hors d'oeuvres (meze) followed by meat and fish dishes.